The application of nuclear magnetic resonance (NMR) metabolomics in cancer research requires an understanding of the many possibilities that NMR metabolomics can offer, as well as of the specific characteristics of the cancer metabolic phenotype and the open questions in cancer research. NMR metabolomics in cancer research presents a detailed account of the NMR spectroscopy methods applied to metabolomics mixture analysis along with a discussion of their advantages and disadvantages. 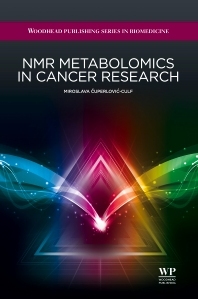 Following an overview of the potential use of NMR metabolomics in cancer research, the book begins with an examination of the cancer metabolic phenotype and experimental methodology, before moving on to cover data pre-processing and data analysis. Chapters in the latter part of the book look at dynamic metabolic profiling, biomarker discovery, and the application of NMR metabolomics for different types of cancer, before a concluding chapter discusses future perspectives in the field. Dr Miroslava Cuperlovic-Culf is a Research Officer at the National Research Council of Canada Institute for Information Technology, an Adjunct Professor of Chemistry at Mount Allison University and an Adjunct Researcher at the Atlantic Cancer Research Institute. She has a range of publications and patents resulting from research in NMR spectral analysis and modelling, bioinformatics data analysis and computational biology for cellular pathway modelling, as applied to cancer research.